Home Babies and Kids Education and Learning Learning Support When should my child learn to read? There is mounting evidence to suggest that not having any literacy skills before kindergarten, sets children up for difficulties at school. Many assume that literacy is a given – it’s something we all encounter at school and master to varying degrees, allowing us to contribute to society in our own unique way. However, statistics have shown that 44 percent of adults in Australia demonstrate below proficiency-level literacy; and 7.3 million lack the literacy skills required for everyday life. Are we going to fix this problem by delaying the learning of skills essential for reading? Recent figures have shown that one in five children starting school won’t have the skills to learn properly. Unfortunately, many parents realise this only once their child starts school – or worse, when they are further along in school and their literacy struggle is impacting other subjects. It’s no surprise then, that research shows that children who start behind in literacy, often stay behind. Those looking for reading classes for preschool-aged children are also faced with a growing suite of options, many of which are not sequential literacy programs; and wonder how these classes differ from the learning that takes place at preschool or day care. Most preschool and long day care offerings focus on learning through play, which is fantastic for this age group. 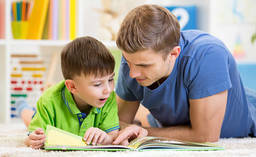 In addition, however, engaging in an early literacy program which covers all predictors of literacy success (including phonological awareness, phonics, concepts about print, word formation/recognition and handwriting) in the year before school, has been proven to give children an advantage. Confidence is another major benefit to the development of early literacy skills. It’s never too early to engage in simple pre-literacy activities! It’s amazing to discover the range of simple behaviours that actually help with literacy. Babies: Reading to children from a very young age has advantages including increased vocabulary and better understanding of concepts about print. • Activities which help them understand the beginning sounds of words, including their name. • Keeping active and crossing their midline will also help toddlers acquire the strength and coordination they need to support the development of literacy skills. • Working on fine motor skills at this age also helps children later develop correct pencil grip. • Continuing to read to toddlers, particularly books which contain rhyme, will help them develop their phonemic and phonological awareness. Try singing nursery rhymes together! Anything being taught at this age should also be tailored to how preschoolers learn – in a holistic, multi-sensory way involving play and exploration. The best approach to literacy is a proactive one – have fun with it and your child will see that learning is fun!